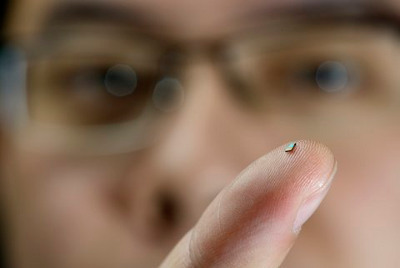 Researchers at Eindhoven University of Technology have developed a very tiny wireless temperature sensor that is powered in a very special way: from the radio waves that are part of the sensor’s wireless network. This means that the sensor needs not even a single wire, nor a battery that would have to be replaced. The arrival of such sensors is an important development on route towards smart buildings, for instance. But the applications are many and various.